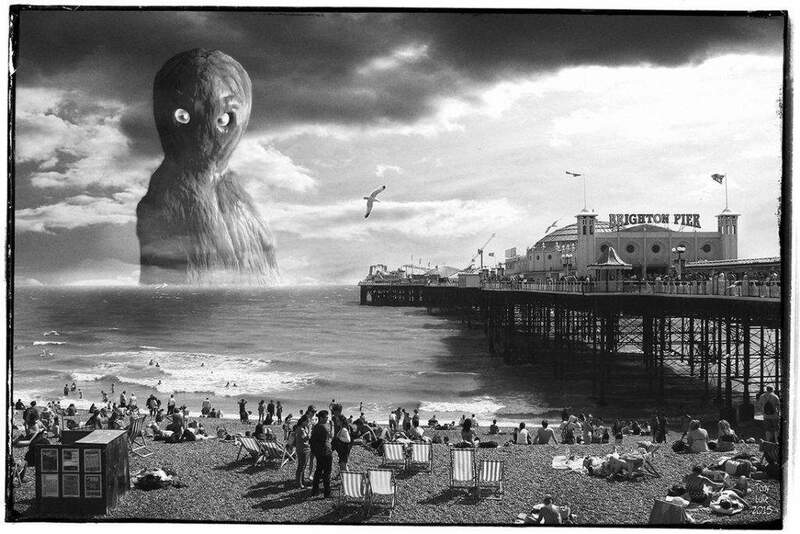 Imagine being a sailor on the high seas and watching as the head of a massive black bulbous monster with large reddish eyes rises up out of the water in front of the ship. It rises higher and higher until it towers over you; a giant dripping behemoth towering many times the size of the ship. And it is looking right at you. Japanese seafarers and fishermen have long told of such sightings. They have even given this creature a name. They call it an Umibozu. The name in Japan suggests that the creature is the ghost of a Buddhist monk. That is because the head of the monster is smooth like the shaved head of a monk. Sailors have traditionally been a superstitious lot. Consequently legends of sea monsters have been told for centuries. And the Umibozu is probably among the most eerie of the lot. This is because of its great size and the story that its mere appearance usually means that the ship is going to be pulled down into the sea. That Chinese sailors also share such a legend makes us wonder if there isn’t credence to the story. They called it the sea bonze. The name is also a reference to the Buddhist priest. And like its Japanese counterpart this creature was believed to attack and sink ships at sea. The Chinese were so fearful of encountering this beast that they often assigned a deckhand to dance around on the ship’s deck, flailing a bright red ribbon, which was believed to frighten the bonze monsters away. In Japan the umibozu was so feared that many fishermen refused to go to sea if one was reported in the area. They carried special weapons on the deck in case such a monster appeared before them. If there was a possible sighting, the ship raced toward shore. All it took was the sight of a large dark shape of something unexplained, like the back of a whale, in the water. In the Tohoku region, the captains of fishing boats offer prayer to the Goddess of the Sea before setting sail. The people there believe that the umibozu appear as retribution on behalf of the Goddess against any ship captain that fails to pay her the proper respect. As the stories are told, umibozu rise in calm waters. But their appearance often heralds a looming storm or some other terrible ocean phenomenon. When they are around, sailors say they sense a personal feeling of dread. In case our readers might think these stories are all mythological lore, consider that old newspaper articles tell of actual sightings from Japan all the way south to New Zealand. A story published in 1971 in the Mainichi Shinbun, a daily Japanese newspaper, offers a first-hand account by sailors on a tuna fishing boat operating near New Zealand. The sailors said that a giant creature became tangled in their lines while they were attempting to pull in their nets. The captain and crew described the part of the beast that appeared in the water as being brown in color, with wrinkled skin and very big eyes, about 15 centimeters wide. There was no nose or mouth. The portion of the body that breached the surface measured about 1.5 meters, which suggests that the entire body was very large. People who research such stories always attempt to find a way to explain the alleged appearances of things like the umibozu. Thus they have suggested that the sailors have mistaken the shells of great ocean sea turtles, massive jellyfish slowly rising from the water, large octopi, or even such natural phenomenon as a rogue wave or a black thunderhead of an oncoming storm rising in the distance.